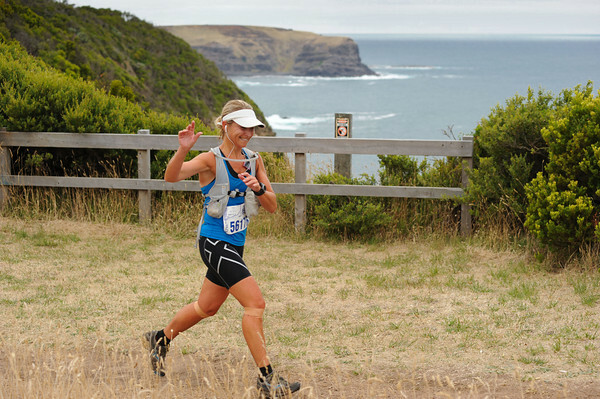 Today I sit down with Nikki Wynd, 2011 Ultramarathon Runner of the Year. Nikki is the only runner to be representing Australia this year at Badwater, California; a 217 kilometre slog through the desert where temperatures can reach over fifty degrees. FootNotes: First of all Nikki Congratulations! How did you feel when you were first informed about this and how long had you been working to try and achieve this goal? Nikki Wynd: Umm, the day I got the text I was really really excited! I was literally sitting at my desk all morning, checking my phone over and over to get the e-mail because I knew it was coming in that day. So when I did actually receive it, it was a massive relief because I’d probably been training for this for about three years, and thought…where to from here if I don’t get in? So it was a huge relief! FootNotes: What has your training schedule been like since you found out you did get in, in regards to kilometres covered, hill training and pace? Nikki Wynd: Umm, to be honest I don’t really on pace, well I sort of do but really it’s more about, learning how to run long and slow, I have probably been trying to cover 180-200 kilometres a week. I have done a couple of races in there as well, which was manly to try and trial things like nutrition, time on feet and because I live out in the Dandenong’s near Lysterfield a lot of my training is done in the hills. So, I follow a structured program which includes; roads, hills, a couple of track sessions as well as religiously trying to cover that 180-200km a week. FootNotes: Have you included any cross training at all? Nikki Wynd: No, it’s mostly just been running and walking. I know I probably should be doing some cross training. My aim when I return from Badwater is to begin Pilates and maybe start doing some strength training…that’s the plan anyway. FootNotes: So what have you done to prepare yourself for the heat, humidity and possible dehydration of Badwater? Nikki Wynd: Umm, I haven’t done anything as yet but we leave in two week, to head to California, so I’m hoping heading there five weeks before the race I can acclimatize, I’ll do some training there and walking around spending time in the heat. I’ll be using my sponsor Tailwind Nutrition to hydrate me, so my crew will keep me hydrated with ice water and Tailwind for the entirety of the race. FootNotes: Have you got a strategy worked out for how much fluid you plan to intake over so many kilometres? Nikki Wynd: I can’t say I’ve worked out anything scientific, but during the race I’ll have my crew spraying me down and handing me bottles of fluid, I don’t think you can have too much water and electrolytes in that kind of race. FootNotes: Have you developed any strategies for the race itself? FootNotes: What kind of eating habits have you adopted for being so successful and running such big kilometres? I must take a pretty big toll on your body. Nikki Wynd: I’m not a big eater, I never have been a really big eater, in fact most people are quite surprised at how little I eat for what I do, but I have consulted Konsita (Rowville Sports Medicine Centres Dietician) and she has advised me that if I’m eating what I’m eating and still able to do the workload that I am completing then it must be working for me. I tend just to snack all day, I don’t eat big meals as I don’t like the feeling of being full; even when I race I just have small amounts of food every half an hour because I just can’t handle large meals. I do try and carb load, so heading into a race I will try and eat more pasta, rice and bread to get the carbs in before a race and then just the small amounts during. FootNotes: What’s been your drive or your inspiration to do what you do as an athlete? Nikki Wynd: I think for me it’s the fun I get from running with my friends, I love nothing more than just going out and doing a fifty kilometre run. Some people go out and sit down to have a coffee or head to a night club and I think this is my thing, running with some many different people I’ve made a lot of different friendships and I suppose it’s always trying to push my body. I started off doing a marathon and just wanted to keep improving. FootNotes: What convinced you to start running big kilometres? Nikki Wynd: I’ve been a bit of a gym junkie all my life, I joined the gym when I was twelve, my dad was really into health and fitness, he’s a strict vegetarian and we were just a very health conscious family. As I got older I’d do one marathon a year, then when I was in my thirties, some friends and I decided we would complete Oxfam 100km walk, it was a huge challenge for me as I’d never done longer than a marathon, so we trained and set out to run the race. I think we completed it in about 15hours and then two years later I went back with a different group, we were the first mixed team to cross the line and did it in 12hours. Then another two years later I went back with another mixed team and completed it in 10hrs 40min which was is the fastest female time ever in Oxfam. Then, this year I went back in a female team, we came second overall and beat the previous record by over an hour. I think just by doing those races, it leaves you asking what’s next. First it’s a 50K, then an 80K, then 100…my furtherest race to date is 246 kilometres, Coast to Kosci, so from Eden to the top of Kosciusko. FootNotes: Working long days and fitting in training must have you leaving the house at all hours of the morning and returning at all hours of the night. What does a typical day look like for you and what does your family think of these habits? Nikki Wynd: It’s funny, I was actually saying to one of the reception staff at work the other day, my life is insane! That’s the only way to describe it. It’s getting up at 5am every morning and getting in a run before work, get myself ready for work and my 10yr old son (Daniel) up and ready for school, I head to work and three nights a week I do a double session, so I run for 2hrs after work, I’ll take Daniel to his sport and go off to do my training which may see me arrive back home between 8-8:30 at night. Then it’s literally having something small to eat and off to bed. Luckily for me, my partner is also my running coach, so we basically train together, live and breathe running our whole life. For some people it’s pretty boring but for us it’s what we love! It’s good for us to be able to train together and we have a lot of running clients so we are able to bounce ideas off each other during training and talk about their programs. Really it’s just great to have someone who supports what you do. FootNotes: Have you had many injuries over your career? Nikki Wynd: Touch wood I’ve had none! Which I think is due to listening to my body, I may want to go out and run 180-200km in a week but if I feel niggles or unwell I won’t push myself to stupid limits. I’m lucky enough to work at Rowville Physiotherapy, so I do see the physio once a week, I have massage, I see Caleb McInnes the Podiatrist at Rowville Sports Medicine Centre who looks after my feet, tells me when to replace my shoes and makes sure I’m wearing the right shoes. I do wear orthotics, so Caleb will inspect them, make sure they are still doing the job they are suppose to be doing. He’ll cut my toe nails and remove any skin build up and all that kind of stuff. FootNotes: What kind of runners are you typically in and is it a part of a sponsorship deal? Nikki Wynd: I am sponsored by Hoka, so I usually wear Hoka Stinsons and Mizuno. Hoka I like to wear for the longer stuff as they are more comfortable cushioned shoes, so I do find they are better for the big kilometres. I will usually begin a race with a Mizuno, as I really like the feel of them, they are a good firm shoe and I’ve always felt comfortable in them, I have a great really good relationship with the guys at Mizuno. I’ll probably take 3-4 pairs of runners to Badwater, I don’t know how often I’ll change them, I try to stay in the one pair for as long as I can. Your shoes tend to melt due to the temperature of the road at Badwater so I have to run on the painted white lines to prevent that from happening. The race this year doesn’t actually go through the notorious Death Valley as it has previous years, so I don’t know if it will actually reach the 50 degree temperatures but the elevation has increased. FootNotes: Do you have any plans for blister management at this stage? Nikki Wynd: I don’t really get blisters, I don’t want to speak too soon but I’ve been pretty lucky, I can usually wear any socks from the discount bin at Rebel and tend to be OK. I do like to wear a thinner sock and I always BodyGlide my feet, so just lather it all over my feet and make sure my nails are short and file away any unwanted skin at night. FootNotes: Well Nikki thank you for your time and all the best with your endeavours as the only Australian to representing us at Badwater this year. Just getting to this spot you have already done us proud. FootNotes will endeavour to catch up with Nikki Wynd when she returns and find out all about the experience. Hi Nikki – I am a fellow Aussie, and live in Bishop which is about 60 miles (100k) north of Lone Pine. Have been crew chief for a couple of Badwater runners (Monica Scholz and Lisa Smith-Batchen). Not sure of my July schedule, but would hope to maybe meet you when you are in the area.